Joe DiMaggio (#0) showing the “Yankee Clipper" smiling after he tied the then-MLB consecutive games hit streak at 44. Ken Griffey Jr. and Michael Jordan. 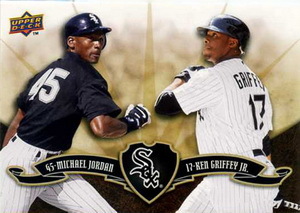 Both legends are featured on the same card wearing their Chicago White Sox uniforms. 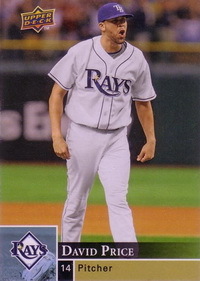 David Price, Tampa Bay's Flame Throwing Super-Prospect, rounds out the list of Short Prints, with a variation of his 2009 rookie card (#401) using a different picture. The more limited version features an image of Price sporting a white jersey with his glove on the mound and calling out a batter. “We look to leverage our assets in spokesmen like Joe DiMaggio, Michael Jordan and Ken Griffey Jr. as a way to provide collectors with some added value and chase in our first baseball release of 2009," said Jason Masherah, Upper Deck's senior brand manager. “Upper Deck produced the first David Price card ever back in 2005 when he was a member of USA Baseball. Having watched him develop into a top pitching talent over the years made us want to do something a little different with his first rookie card. We think this variation will help create some additional interest without compromising the integrity of the base set." I was looking through my 2008 Upper Deck Factory set box for rookie cards when I noticed that the numbers in Becketts’ don’t match the numbers on the back of the cards. How is that possible if the box set and regular cards are alike?